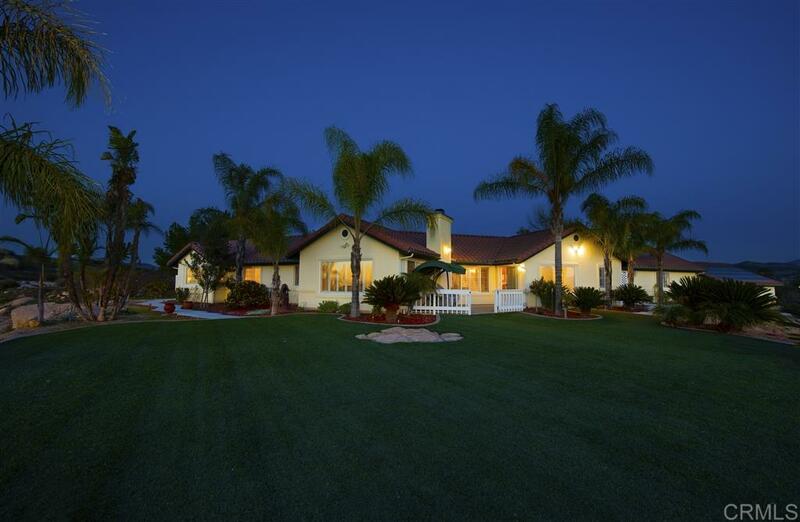 Magnificent estate sits on top of the hill with sweeping views of the Ramona valley and mountains on appx. 3 1/2 acres. Set up for entertaining w/formal courtyard entry. 4 BR home + detached 2 BR secondary dwelling. 3 car attached garage w/AC + detached 2 car garage + 28 x 28 shop + horse corral. Well + city water and solar is owned. Horse corral. Built to a higher standard by a contractor as his own residence with coffered and beamed ceilings, shutters, skylights and upgrades everywhere you look., Fruit trees include lime, lemon, apricot, apple, plum, peach, orange, avocado, macadamia, olive grove. Also grapes, goji and blueberries. Outdoor fireplace and seating. Tankless water heater.